When we got our first look at God Of War III last week, Sony said it would wait until E3 to announce the game's release date, which now appears could be sometime in 2009. According to a recently issued press release designed to remind us that Killzone 2 ships next week(! ), God of War III will be released sometime this year. The PlayStation 3 title is just one of many games the publisher has planned over the next year, including Zipper Interactive's MAG, the "massive action game" it announced at E3 2008. The list of 2009 hits also includes Uncharted 2: Among Thieves, inFamous, Heavy Rain, and MLB 09: The Show, many of which were already expected to hit before the holidays. 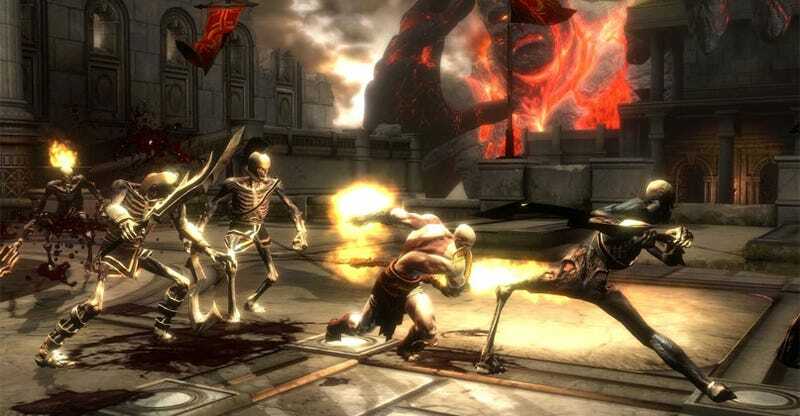 While a 2009 release for God Of War III doesn't sound unreasonable, it's a little bit surprising, considering that the game still appears to have some design decisions that still need working out, even for a game that is still potentially nine months out. That, and Sony's 2009 line up is looking mighty strong, even without the help of Kratos. We suppose that Sony's wording could give them an out, dating the title for as late as February 19th, 2010, a year after the release hit. We'll know for sure at E3 2009, if Sony's plans don't change.